Boone’s Drug Store, probably sometime in the 19-teens. 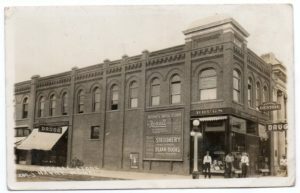 The Cottage’s original owner’s establishment, located on the southwest corner of First Street and Third Avenue. The New You Hair Salon, J. M. Donovan Designs in Fine Jewelry, Ruff Realty and the exit from Havre Beneath the Streets is now located here. Daniel Boone’s Drug Store-original owner of The Cottage.